The Mas de Paraloup is a beautiful ancestral home anchored in its Ardéchoises origins. The coincidence of life has made that it passes for 5 generations from mother to daughter which reflects in the softness of the environment. 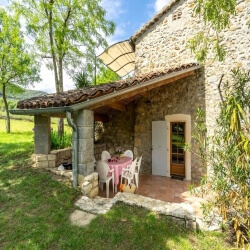 classified with 3 * nestled in a beautiful landscape in the South Ardeche! 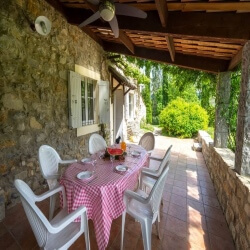 At only 4km from the town of Vallon Pont d’Arc and 2km from the village of Lagorce you will find le MAS de PARALOUP (a farmhouse which has been in the family for 7 generations passed from mothers to daughters). This Provençal Mas is located in the sunniest part of the Ardècheamong vineyards, lavender fields and olive orchards. Built in the 18th century, during the golden days of silkworm farming, later converted into a wine estate. Enjoy the warm, quietness and beauty of the 4 bespoke Gîtes tastefully refurbished. Unforgettable tours across the southern Ardèche and its maze of rivers. Swimming and relaxing under the Mediterranean sun at only 4km from the famous canyon of the Ardèche river. Without any doubt, this will become your favourite holiday destination. Especially for those who want to associate tranquillity, clean air, scenic views and an endless hiking opportunity. Moreover, the singing of the cicadas will welcome you in Le Mas de Paraloup. Charming artist’s villages, delightfulnarrow streets, typical Provençal markets, you will find it all. With so much to do, you will find it hard to stay put.Although you will be staying in an amazing place! • A real paradise for aquatic sports. Wild water canoeing (all levels), rafting, fishing and swimming are possible in the breath-taking Gorges de l’Ardèche at only 4km or the Ibie (paddling) which is ideal for small children. • Hiking: starting directly from the Mas, many Roman tracks taking you through vineyard terraces, in the heart of a magnificent wilderness. • Cycling and MB-sports between Ardèche and Cevennes. • 300 prehistoric caves, among which the famous Caverne du Pont d’Arc – Grotte Chauvet, which contains the oldest rock paintings in Europe. • Horse riding. Many stables in the direct area, however our favourite is “La Loubière”, only 6km away, offering great trekking. • Tennis court at Lagorce. • Between the plum trees from my grandfather’s era is a playground with among other things a climbing- rope, a swing and a slide. • “Petanque” (French bowl) court for all ages. • Lagorce, 5mn by car and 30mn by foot offers a small grocery shop with a traditional bakery, and newspapers! 2 restaurants and several wine cellars to discover. •Vallon Pont d’Arc, 15mn by car or 1 hour by foot offers all amenities, market, numerous shops, restaurants and wines cellars. • At 5 to 15 minutes by car you will find a number of vineyards in an authentic scenery who have been in the family for ages handed over from father to son. The wine-growers will be happy to receive you and you will find a large selection of wines which are traditionally produced with passion and love. • Across beautiful sceneries, you reach impressing sites such as Avignon, the Pont du Gard, Nîmes and Uzès (distance about 1h30 by car) or Les Beaux, Arles, Aix, St Rémy and Montpellier (distance about 2h30). • By leaving at 8am, you can lay on a sandy beach at 10 am! And your peaceful ness will be waiting for you in the evening. • The Mas is available from April till October for a minimale period of 2 weeks in July/August. • Our rentals stretch from Saturday 4 pm to Saturday 10 am. • Water and electricity are included in the rental price. • We supply linen: blankets, duvet and tea towels but towels are not provided so don’t forget to bring them with you, bed sheets possible on request. • Sheets are available for rent at € 8,-/pers/switch, the beds are made on your arrival. • Children cot, high chair, bath-tub baby available on request. • Security deposit at € 200,-/Gîte. The guarantee deposit will be refunded to your bank account within 7 days after inspection of the holiday rental. • Accommodation tax per person and per night: 1,15 € >18 years old. • Pets are only admitted if it has been agreed beforehand, one pet max/gite and against payment of 30 €/week. They must be on a leash at all times, respect hygiene rules and not bother other guests. • We recommend you take out an insurance protecting you from any unforeseen late cancellation of your booking.